At The Furrow, we strive to bring the world of farming to our readers. One of the things we continually find is the similarity in the challenges farmers face around the world. In Central Africa, though, we have found farmers facing unique obstacles. Pushed from their land by mounting civil conflict, thousands of farmers from the tiny African nation of Burundi now live in refugee camps in neighboring countries, waiting for the chance to return home. Their hope, tenacity, ingenuity and love of farming keeps them going in the most desperate of times. Reported by an African agricultural journalist who is himself in exile, The Furrow is proud to bring you the story of these remarkable farmers. The Mahama Refugee Camp in eastern Rwanda is a tough place to be a farmer. The 120-acre camp was established in April 2015 to accommodate Burundian refugees fleeing the growing violence in their homeland, where President Pierre Nkurunziza sparked a constitutional crisis for running for a third term. The president’s move—accompanied by protests, fighting among military and police units, waves of arrests, and the deaths of more than 1,000 people—awakened political and ethnic animosities that had been buried since the end of Burundi’s last civil war in 2006. Since April 2015, nearly 400,000 refugees have fled Burundi to neighboring countries. 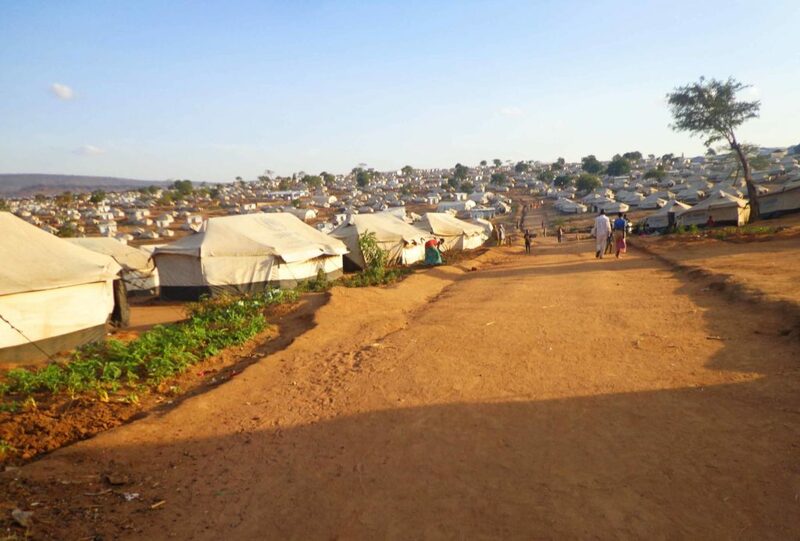 About 85,000 are in Rwanda, including more than 53,000 at the Mahama Refugee Camp, where 160 new arrivals each week are straining the camp’s infrastructure. The United Nations High Commissioner on Refugees predicts the number of Burundian refugees will cross the half-million mark this year. About 60 percent of the inhabitants of Mahama are farmers who abandoned their land or left it in the hands of family or friends. As Burundi teeters on the brink of another civil war, the tiny nation’s agriculture is threatened. But with few natural resources and a land mass the size of Maryland, Burundi rarely captures headlines outside of Africa. Conversations with farmers in Mahama Refugee Camp last fall offer glimpses at the chaos inside Burundi. Fleeing Murder and Chaos. Paul Nyabenda fled to Rwanda in April 2015 with his two wives and 12 children, leaving behind two houses and 17 acres of banana, cassava, beans, and corn. Since leaving Burundi, the only word on his farm trickles into the camp as rumors. His fear is that his cousin will sell the land and leave him destitute. Pascal Ndururutse arrived in the camp in June 2015 with his wife and seven of his children. His first-born remained in Burundi, but his farm’s future is as shaky as Nyabenda’s. The 58-year-old exile sent his second-born son back across the border to find out what was happening to his land. In a shocking twist, the first-born accused his brother of being a Rwanda-trained spy reporting to rebels in Rwanda. The younger son was arrested and taken to central prison in Bujumbura, Burundi’s capital. The Mahama Camp is home to more than 53,000 refugees. About 60 percent of the inhabitants are farmers who abandoned their land or left it in the care of friends and family. Nathalie Minani fled with her two children after her husband was killed in July 2015. The 36-year-old widow has no idea who is farming the 20 acres of corn and cassava she left behind. Monthly rations in the camp—distributed by Adventiste Development and Relief Agency (ADRA)—include 24 pounds of corn, eight pounds of beans, five ounces of salt and a quart of oil per person per month. Because every person and every fetus in the camp is granted a ration, there is a baby boom in refugee camps across the region—a demographic bulge that portends trouble when families return home to split meager resources and small farms. For those farmers who remained in Burundi, each crop is uncertain—not just because of concerns of another year of drought, but because they are not sure whether they will be on the run from militants or the government, or even dead, by harvest. Work and Entrepreneurship. Some farmers, fleeing without any money or goods to trade, draw on their experience and work as day laborers. After her husband was killed in the unrest of 2015, 46-year-old Annonciate Nduwimana left behind a 10-acre farm and escaped to Rwanda with her four children. She sold portions of her ADRA food rations to save up about $9.50, which she invested in two hoes—one for herself and one for her 22-year old son. The two refugees hire themselves out to local Rwandan farmers as fieldhands, each earning 90 cents per day. “I do work from 6:00 a.m. up to 3:00 p.m.,” Nduwimana said. “It is indeed a tiring work for a woman of my age, but I have no option. We are surviving”. But around the Mahama Refugee Camp, glimmers of hope—and the entrepreneurial spirit of farmers worldwide—come to light. In September 2015, 32-year-old Gerard Barutwanayo left behind 10 acres of vegetables and a 2.5-acre eucalyptus plantation. He is unsure who has taken over the farm or whether he will ever get it back. To feed his family in the camp, Barutwanayo constructed an ingenious raised-bed kitchen garden in the camp with wooden stakes and tarps. Stacked like a wedding cake, the round, multi-layer beds burst with carrots, cabbages, onions, and other staples. 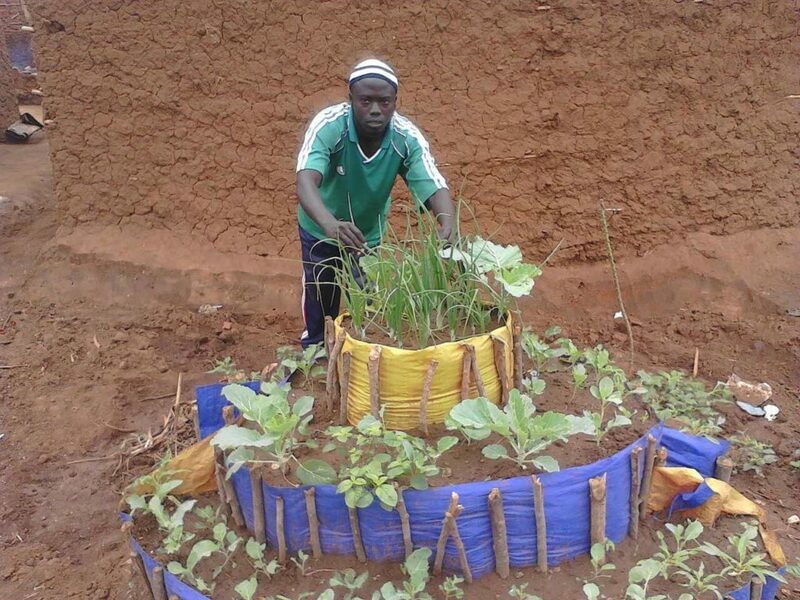 Barutwanayo has since helped other farmers in the camp build garden beds. Stacked like a cake, these “kitchen gardens” help sustain displaced families at the Mahama Refugee Camp in eastern Rwanda. Going Commercial. Mélanie Ndikuriyo fled Burundi after her 22-year-old son was killed during the 2015 protests. She leases her farm in Burundi to her sister and has invested the payments in renting land along the Akagera River outside the refugee camp. On her three small plots—160 square feet each—she plants potatoes, eggplant, tomato, tobacco, corn, and beans. With money she is making from the sale of surplus crops, she is planning to lease 2.5 acres to go into business. Farming along the river isn’t easy. All field prep and weed control is done with a hoe, and farmers must sleep with their crops to try to keep hungry hippos from raiding their fields. For families desperate enough to sell their rations to invest in a plot to farm, even the current $3.50 rental rate for a 160-square-foot garden is a hardship. Refugees complain that the rent is based on commercial use, and are working through ARDA to try to negotiate cheaper leases for subsistence plots. Even in the face of dire poverty, the camp has free-market opportunities that favor sharp-eyed operators. After sending his wife and five children to safety in Rwanda, 35-year-old Jacques Summuhayo stayed behind to arrange a three-year lease for his 17.5-acre rice farm. He fled to the Democratic Republic of Congo, then worked his way to Rwanda to reunite his family in Mahama. The land around Mahama is not suited for rice production, so Sumuhayo became a “mami”—in Kirundi, it’s the word for a broker who increases the weight of his corn—mastering the art of adding 20 percent to the weight of his corn by saturating it with water. He invested the lease payments in purchasing corn, oil, beans, honey wine, oil, salt, energy drinks, and other goods from refugees eager for cash, then re-selling them to others coming into the camp with money. Uncertain Outlook. Nobody is sure when Burundi’s refugees may return home. Nkurunziza has openly begun pondering a fourth term, arrested journalists and political opponents, and evicted African Union and UN monitors. There have been rumors of rebel militias forming along the borders, and radios crackle with ominous foreshadowing of a return to the Hutu-vs.-Tutsi violence that left 300,000 Burundians dead in the 13-year civil war that ended in 2006. Even if they can return in peace to their farms, it’s likely Burundian farmers will find themselves entangled in land conflicts with the people who have taken over their fields. The government enacted land reforms to compensate refugees from crises in 1965, 1972 and 1993 who lost their property after decades in refugee camps. But the prospect of hundreds of thousands of refugees—including the children being born in the camps—returning to occupied farms could increase the already-growing number of murders over land claims that have added to Burundi’s violence since the start of this decade. As Burundian politics and law follow their course, hard-working farmers in the Mahama Refugee Camp and others like it that encircle the small nation are making due in dire circumstances, drawing on the hope that keeps farmers always looking toward harvest.